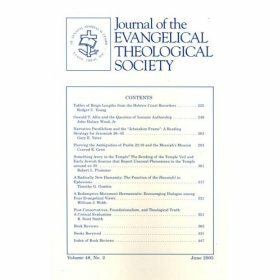 Last week I attended the Evangelical Theological Society‘s (ETS) annual meeting. I am a new member of the society and this was my first time to attend the meeting. Around 2,200 people were in attendance and, essentially, the three days are spent listening to theological and philosophical papers prepared and read by various presenters. In a couple of ways I was the odd man out last week. First of all, the ETS is apparently almost totally made up of Baptists, i.e., those who have a Reformed theology. I, being a classical Pentecostal, would not call myself Armenian, but I am certainly not a Calvinist. But that’s not what the week was about and I was not made to feel like an odd man out. I didn’t feel connected either, but I wasn’t there for the warm fuzzies. Second, I would say everyone there was a professor or a theological student looking to become a professor. I was not intimidated by that. I wasn’t lost or over my head or unable to follow the conversations or presentations. I am an academic as well; I have just chosen to teach in the local church rather than pursue the academy. Occasionally, I hear Pentecostals express confusion when I group Pentecostals in with Evangelicals. I think the confusion stems from the tendency of Pentecostals to separate themselves from the rest of the church. No one loves Pentecost any more than I do, but Pentecostal scholarship tends to lean toward liberation theology, as if for some reason that would give us more credibility with non-Pentecostal, even non-Christian intellectuals. It’s as though we are always trying to prove that we are not from the other side of the tracks (more about all of this some other time). And, of course, we have been separated from others by the others because we speak in tongues. The point is, while many Evangelicals are not Pentecostal, it is pretty rare to find a Pentecostal that is not an evangelical. So, what is an Evangelical? David Bebbington, Professor of History at the University of Stirling in Scotland, is known for his “quadrilateral” definition of Evangelicalism. For Bebbington, the defining marks of an Evangelical are Biblicism (particular reverence for the Bible), crucicentrism (focus on the death, burial, and resurrection of Jesus Christ), conversionism (the belief that people need to be born again), and activism (the conviction that we should actively share the gospel). Of course, all of these things apply to Pentecostals. I enjoyed the week because I love theology and theological philosophy. I also enjoyed it because there were excellent resources available from every major Christian book publisher at excellent prices (I couldn’t resist!). I enjoyed the city of Baltimore (or what I saw of it). But, as enjoyable these things were, they were not the most important aspects of the week. I joined the ETS and attended the annual meeting because Evangelicalism is under attack from without and within and, as an evangelical Pentecostal, I have an interest in that. The theme for this year’s meeting was, “Evangelicalism, Inerrancy, and ETS.” And when it comes to the issues that surround inerrancy and the theological defense of the Bible and the gospel, those issues have a home in the ETS. The ETS Annual meeting was not simply a rehearsal of what everyone present believed. The presence of Peter Enns guaranteed that! There was room for some dissent and diversity as evidenced by the panel discussions. It was, I think, and atmosphere of vigorous discussion and debate, though the society seems to project a vivid recollection of those who have either left their number or were asked to leave based on their inability to agree upon the Bible’s inerrancy. All in all, I was challenged by the various sessions I participated in and I am looking forward to next year’s meeting. Your thoughts on this Tozer Quote . . . I really enjoyed the clarity of the Pentecostal & Evangelical positions.